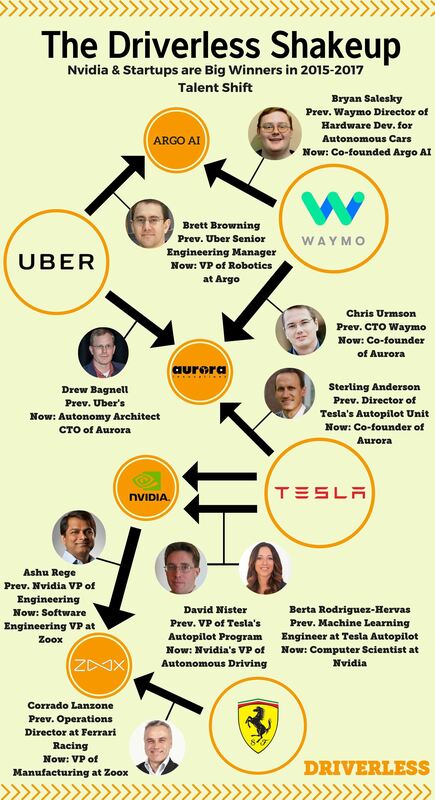 Among those with research experience and expertise in neural network-based artificial intelligence that can be applied to self-driving vehicles, Nvidia and startups Aurora and Argo AI have drawn top engineers from Waymo, Tesla, and other companies. Uber, which along with China's Baidu and Faraday Future, have seen a particularly large exodus of talent. Here is an infographic of the comings and goings of some of driverless' best-and-brightest lead engineers.